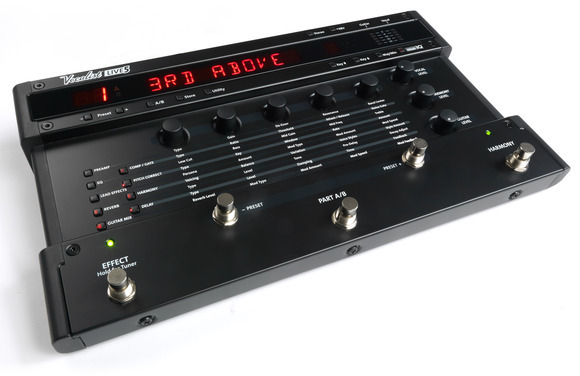 SALT LAKE CITY, Utah -- DigiTech®, a leading manufacturer of vocal processors, and a Harman International company (NYSE-HAR), has introduced the newest addition to the Vocalist® product line, the Live 5 processor. The Live 5 is designed to provide guitarists with the most intuitive, user-friendly, vocal effects and harmony processor available. The pedal will give artists the ability to effortlessly create full, natural sounding 5 part vocal harmonies. The Live 5 combines studio-quality audio performance, state-of-the-art vocal processing, and an easy-to-use control interface to add up to four independent voices of harmony to a lead vocal to create a full five-part harmony.. The Live 5 has Gender Control that gives each harmonizing voice a masculine or feminine sound. Users can customize the natural sound of the harmonizing voices from loose to tight by adjusting the Humanize setting. The new Vocalist Live 5 makes it easier than ever to set up and personalize multi-part vocal harmony by automatically following your vocals and chord progression using patented musIQ® technology. MusIQ eliminates the need to pre-program the songs' key or key changes to create accurate harmonies, making the Live 5 much easier to use. The built-in chromatic pitch correction in the Live 5 has the most natural sound available on the market. There are different vocal effects available to help give the vocals a high-quality, professional-grade studio sound. These effects include preamp, compressor/gate, lead effects, harmony, reverb, effects, and echo/delay. There are three different room settings for reverb and five separate delay settings for vocals. The Live 5 also has guitar effects, reverb, chorus and flange as well as 100 presets to save vocal effects and harmony setting, each with an A and B parts for quick, easy changes on-stage. Visit the Vocalist website online at vocalistpro.com for more information about the new Live 5. The Vocalist Live 5 is now shipping with an MSRP of $649.95. HARMAN (www.harman.com) designs, manufactures and markets a wide range of audio and infotainment solutions for the automotive, consumer and professional markets -- supported by 15 leading brands including AKG®, Harman Kardon®, Infinity®, JBL®, Lexicon® and Mark Levinson®. The Company is admired by audiophiles across multiple generations and supports leading professional entertainers and the venues where they perform. More than 20 million automobiles on the road today are equipped with HARMAN audio and infotainment systems. HARMAN has a workforce of about 11,000 people across the Americas, Europe and Asia, and reported sales of $3.2 billion for the last twelve months ended March 31, 2010. The Company's shares are traded on the New York Stock Exchange under the symbol NYSE:HAR. musIQ™ is a trademark of 3dB Research Ltd.